Come at GoPro, you'd better not miss. The likes of Sony and Garmin have tried to take on the market leader without much luck, so kudos to Drift for at least staying in the game. As the "2" suggests, this isn't the UK firm's first action camera, but it is their smallest yet, sacrificing the colour preview screen you'll find on the pricier Ghost models to squeeze everything into a smaller package. A Drift Stealth 2 is going to set you back £199.99 direct from the manufacturer, and (as you'll know if you've ventured onto the GoPro site) that makes it more affordable than some of its rivals. If you want high-definition action camera footage at a low price, then you've come to the right place — but you're going to have to make some compromises along the way. Just how important looks are in an action camera is debatable, but the Drift Stealth 2 isn't going to win any beauty contests anytime soon. It's chunky and rubberised, so good for when it comes loose from your ski poles, but not quite as aesthetically pleasing as GoPro's little boxes. With no touchscreen you're reliant on buttons, which are big and ridged to help you know exactly what you're hitting. The ports and memory card slot are hidden behind a flap that you screw off — again, good for durability, but not the easiest way to access the USB port. A 1.3-inch monochrome backlit LCD does the job of showing mode, battery and storage information (though it can be difficult to see in bright sunlight). On the other side is a screw attachment for fixing accessories to, while on the top there's a big LED light that leaves you in no doubt whether the camera's recording or not. Dimensions of 80 mm (3.5 inches) by 42 mm (1.65 inches) by 27 mm (1.06 inches) plus a weight of 97g mean the Stealth 2 is easy to clasp in the palm. It's longer but thinner than a GoPro. Overall, it's designed with purpose and practicality in mind, even if the overall effect feels like you're buying a no-frills store-brand version of a luxury item. There are a selection of photo and video modes to choose from, which we'll get to shortly, and the lens offers a 137-degree field of view. It's "weather resistant", not waterproof, so a few drops of rain won't hurt it but a dunk in the pond probably will. Drift has given some thought to accessories as well. You can get a two-way remote (£24.98), a waterproof case (£24.98) and a replacement lens (£19.99) direct from the manufacturer, and we had a suction grip and a selfie stick included in our review bundle. Lack of accessories aren't going to be a problem, at least, and they don't increase the overall price by too much. There's also Wi-Fi remote control available through a free iOS or Android app. It proved to be jerky but passable in our tests, and you'll feel the battery drain — it's probably best that you use the app to set up your shot and then turn the Wi-Fi off. Speaking of battery life, Drift says three hours of continuous recording, but we reckon it's more like two or two-and-a-half based on our time with the camera. The percentage drops 10 points at a time, so it's difficult to be accurate, but you can count yourself lucky if you eke out three whole hours from a single charge. The lens offers 300 degrees of rotation, which means you can twist around the frame of view no matter what angle the camera's at — it's one of the few standout features on the Stealth 2 that set it out from the crowd and it might be exactly what you're looking for. It's in the video quality modes that some of the camera's shortcomings become apparent: it peaks at 1920 x 1080p, 30 frames-per-second footage, while the latest and greatest GoPro Hero4 Black offers 4K (3840 x 2160 pixel) video at the same frame rate. That said, the Hero4 Black does cost more than twice as much right now, so for many amateur film-makers the trade-off is probably worth it. The video we recorded was very impressive and certainly won't disappoint the majority of people who pick up the Stealth 2. The camera began to struggle with very fast action or very low light — but then again this is a camcorder you can hide in your palm, not an IMAX-capable rig from a film set. For the size and cost of the Drift Stealth 2, the footage it captures is surprisingly good. As well as 1080p video at 30fps, you can cycle down through 960p at 30fps, 720p at 60fps, 720p at 30fps, WVGA at 120fps (for slow motion shots, though the quality isn't great) and finally WVGA at 30fps (for your car dashboard recording needs or something similar). Speaking of cars, it has a special auto mode that will constantly record and overwrite on a loop if it's plugged into your vehicle's charger — you can use it as an effective dashcam when you're not mountain biking through the forest. There are several photo modes here too: single shots at 12, 5 or 3 megapixels, as well as burst and timelapse modes. We put the Drift Stealth 2 through its paces snapping images and came away a little underwhelmed — this isn't going to replace your digital camera or even your top-end smartphone anytime soon. Some smaller details were lost in fuzzy noise, especially when the light wasn't perfect, although colour reproduction was satisfactory. The Stealth 2 will do a job when you don't have any other camera on you, but it kind of takes the wind out of the sails of the timelapse mode when the snaps are this ordinary. We did like the satisfying shutter sound though, so that's one small point in the Stealth 2's favour. Before we finish we should also mention the HDMI-out port (for showing off your images and video on the big screen) and the auto-tagging feature that lets you record footage continuously but only keep the highlights, marked with a press of a button. 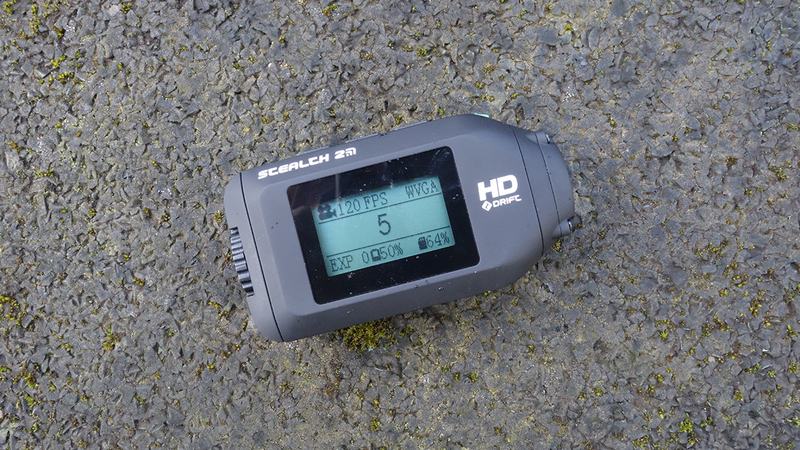 We liked the Stealth 2: it has a compact, durable design, it shoots very good video, and you get a decent number of modes as well as some useful extras (like the remote control app and car dashboard mode). Perhaps it's biggest problem is the budget GoPro is almost half the price and matches it on recording quality and most features. The Stealth 2 is more flexible in terms of shooting angles, but it's still a tough sell when held against the biggest name in the market.